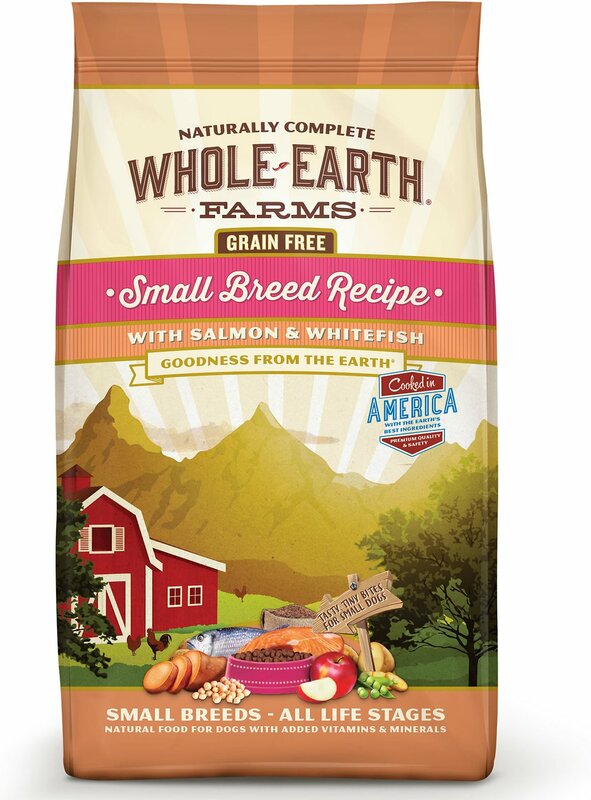 Give your pup some “goodness from the earth” with Whole Earth Farms Small Breed Recipe Salmon & Whitefish Grain-Free Dry Dog Food. This thoughtful recipe delivers complete and balanced nutrition through high-quality, natural ingredients that are cooked in the USA. This formula provides your pup with multiple protein sources, vitamins and minerals for optimal nutrition. 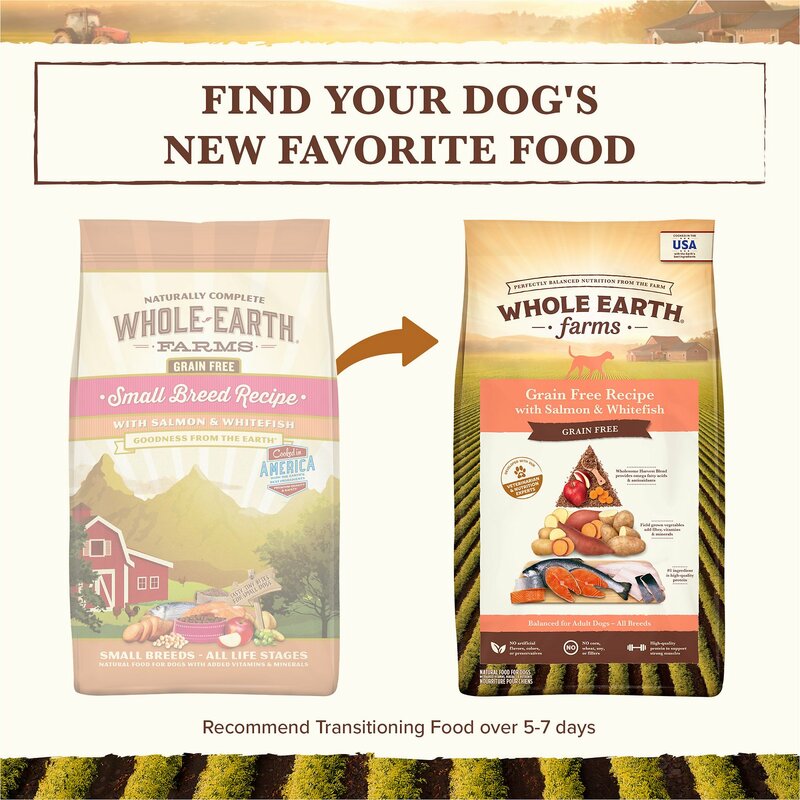 Made without any corn, wheat, soy, by-products, artificial colors, flavors or preservatives, you can be sure you’re feeding your pup quality food made from the Earth’s best ingredients. Features protein from salmon and whitefish to give your pooch the energy he needs to be active. Grain-free is perfect for pups with sensitive stomachs, and the added vitamins and minerals provide a well-rounded meal. Made without any corn, wheat, soy, by-products, artificial colors, flavors or preservatives, for a recipe you can trust. Salmon Meal, Dried Potatoes, Peas, Dried Chickpeas, Chicken Meal, Tapioca Starch, Chicken Fat (preserved with mixed tocopherols), Ground Flaxseed, Natural Flavor, Salmon, Whitefish, Dried Sweet Potatoes, Organic Dried Alfalfa Meal, Salt, Potassium Chloride, Yucca Schidigera Extract, Minerals (Iron Amino Acid Complex, Zinc Sulfate, Zinc Amino Acid Complex, Manganese Amino Acid Complex, Copper Amino Acid Complex, Potassium Iodide, Cobalt Proteinate, Sodium Selenite, Cobalt Carbonate), Choline Chloride, Vitamins (Vitamin E Supplement, Vitamin A Acetate, Vitamin B12 Supplement, d-Calcium Pantothenate, Vitamin D3 Supplement, Niacin, Riboflavin Supplement, Biotin, Pyridoxine Hydrochloride, Folic Acid, Thiamine Mononitrate), Dried Lactobacillus plantarum Fermentation Product, Dried Lactobacillus casein Fermentation Product, Dried Enterococcus faecium Fermentation Product, Dried Lactobacillus acidophilus Fermentation Product, Dried Blueberries, Rosemary, Sage, Thyme, Cinnamon. For dogs over 30 lbs, add 1/4 cup of dry dog food for each additional 5 lbs. How much food your dog eats each day is dependent upon size, level of activity, stage of reproduction, and environment. When feeding in measured amounts, feed according to the weight of your dog and adjust feeding level to your dog’s individual needs. Keep fresh water available at all times. 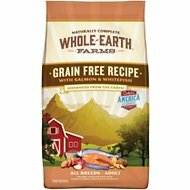 I have used Whole Earth pet food for sometime. After my grey had many of her teeth out, I looked for smaller kibble to supplement her soft food. These “small breed” flavors are just right. I got this salmon and whitefish for some variety from the chicken. She loves it! (Now I wish they’d make the Turkey and Duck kibble in small breed. That was her favorite!) This food is high quality as grain free. She does really well. Perfect poops and never an upset tummy! Dogs seem to love it! It is small enough for my 2 older Malti-poos. They both have bad teeth or missing teeth. Most foods would just sit there for days but this food gets eaten daily. My mini Dachshund loves the salmon & whitefish Grain-free dry dog food. She has been grain-free since she was 2.5 years old when she experienced irritated skin. She has had no problems since eating Whole Earth Farms grain-free products. I gave this a try since my dogs are picky eaters. It's been a good change for them but not sure they would like it all the time. Generally, a good product. My two little dogs LOVE this food. It keeps their coats shiny and they never itch. We've tried a bunch of other sensitive skin and stomach foods but this is the one our dogs like best. And it's affordable! 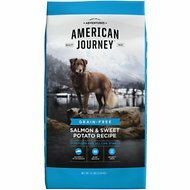 The fish flavors of this food have my dogs loving it. My 5lb Maltese Cosmo has enjoyed the Whole Earth Farms food for small breeds. Im very particular about the ingredients which need to be organic with NO COLOR or FILLERS. This hits the mark!